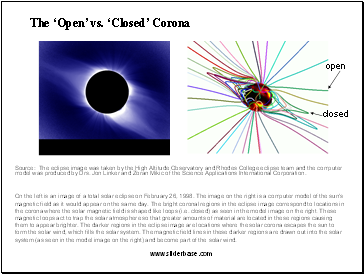 These images were taken by the Precision Solar Photometric Telescope at Mauna Loa Solar Observatory in Hawaii. They show how the Sun looks at two different wavelengths of light. The image on the left was taken through a filter that allowed only blue light through. It shows the photosphere of the Sun, that layer from which most of the light we see freely escapes into space. In this image sunspots are visible as dark patches because they are cooler and thus emit less intense light. Also visible in the image are faint patterns due to convective motions in the Suns surface layers. 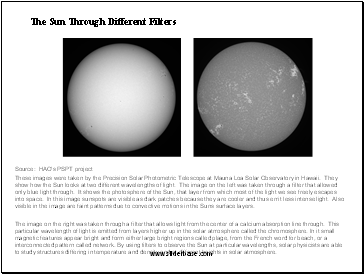 The image on the right was taken through a filter that allows light from the center of a calcium absorption line through. This particular wavelength of light is emitted from layers higher up in the solar atmosphere called the chromosphere. In it small magnetic features appear bright and form either large bright regions called plage, from the French word for beach, or a interconnected pattern called network. By using filters to observe the Sun at particular wavelengths, solar physicists are able to study structures differing in temperature and density and at different heights in solar atmosphere. These images show examples of enormous sunspots. The one on the left shows an image of the entire Sun to demonstrate how big the spots can get (sometimes as big as several Earth diameters across). 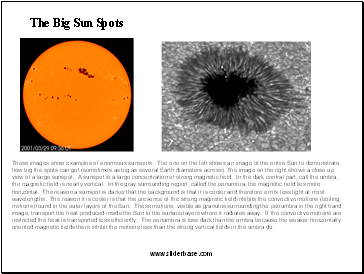 The image on the right shows a close up view of a large sunspot. A sunspot is a large concentration of strong magnetic field. In the dark central part, call the umbra, the magnetic field is nearly vertical. In the gray surrounding region, called the penumbra, the magnetic field lies more horizontal. The reason a sunspot is darker that the background is that it is cooler and therefore emits less light at most wavelengths. The reason it is cooler is that the presence of the strong magnetic field inhibits the convective motions (boiling motions) found in the outer layers of the Sun. These motions, visible as granules surrounding the penumbra in the right hand image, transport the heat produced inside the Sun to the surface layers where it radiates away. If the convective motions are restricted the heat is transported less efficiently. The penumbra is less dark than the umbra because the weaker horizontally oriented magnetic fields there inhibit the motions less than the strong vertical fields in the umbra do. Source: The eclipse image was taken by the High Altitude Observatory and Rhodes College eclipse team and the computer model was produced by Drs. Jon Linker and Zoran Mikic of the Science Applications International Corporation.